It’ll be published in Canada (pre-order from Amazon here) by McClelland & Stewart, and in the U.S. (pre-order from Amazon here) by HarperCollins. Japanese and Korean editions are in the works, and hopefully other international editions will follow. 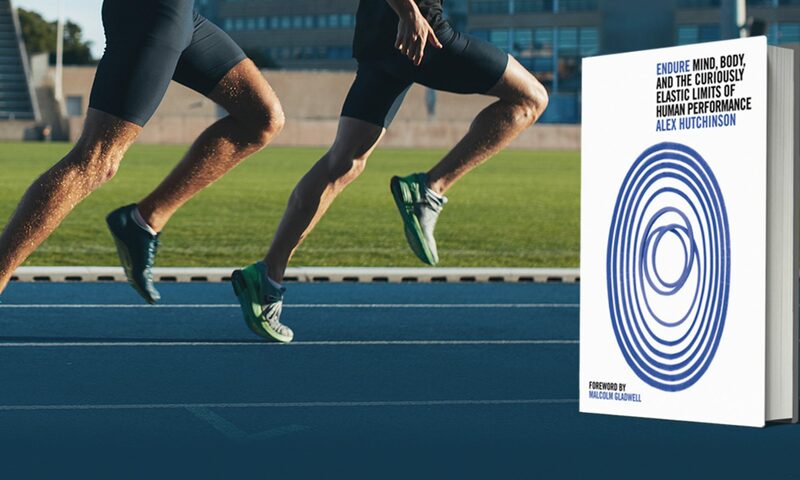 Note that if you click on the Canadian links, they still have old title listed, which was “Sweat Science” instead of “Which Comes First, Cardio or Weights?” It’s the same book — the marketing people determined that having a question in the title would cunningly lure people into picking up the book in search of an answer. Just noticed a great post on Amby Burfoot’s Peak Performance blog where he interviews Paul Thompson, the Hartford Hospital cardiologist who’s the go-to guy for questions about exercise and heart health. It’s a fantastic interview, very wide-ranging, with Thompson sharing his thoughts, hunches and beliefs about a bunch of the current controversies in this area. The key issue with Mohlenkamp’s runners is that their cardiac risk scores are compared using their present cholesterol, blood pressure, and other health numbers. They might have had terrible numbers before they started running, so when their coronary calcium is compared with folks who are not athletes, but had good risk numbers all their lives, it looks like the runners had more calcium, ie, more atherosclerosis than predicted by their risk factors… Many of the runners “got religion” when they turned 40 or so. This is a classic illustration of why a single study, or even a single group of studies, can so easily point us in the wrong direction. On the surface, it looks simple: take a bunch of marathoners, compare them to controls, and presto — marathoners have worse arteries. But it’s easy to be led astray by underlying factors (not to mention, as Thompson points out, that the hard, stable arterial plaques found in the runners may actually be a good thing, as opposed to soft, unstable plaques that are easily dislodged). Anyway, it’s an interesting read, and Burfoot does a great job “pinning Thompson to the mat” to get his (well-informed) opinions and best guesses on a bunch of topics. Does skipping breakfast make you fat or thin? Therefore, overweight and obese subjects should consider the reduction of breakfast calories as a simple option to improve their daily energy balance. Heresy! Or is it… I decided I should at least read the paper. It turns out this is, indeed, a long-running debate. The authors of the new study, from the Else-Kröner-Fresenius Center of Nutritional Medicine (in Munich, where compound nouns are a way of life), argue that previous studies have been guilty of what seems like a fairly obvious error in interpretation. These previous studies have found that the higher the proportion of your daily calories you get at breakfast, the lower your overall caloric intake is that day. But these results are skewed by days when people choose to have unusually small lunches and dinners, the new study argues. The details of this statistical debate are fairly intricate — and not that interesting, actually. Because the strongest arguments for breakfast were never predicated on the theory that you’d eat less later. It’s the other side of the energy balance equation that’s more interesting. By taking in the calories at the start of the day, you’re getting them right when you need them, rather than later when your physical activity for the day is done. You’re also getting your body out of starvation mode so that you’ll choose healthier foods and not store everything as fat when you finally cave in and have some food. [P]articipants who skipped breakfast in both childhood and adulthood had a larger waist circumference and higher fasting insulin, total cholesterol, and LDL cholesterol concentrations than did those who ate breakfast at both time points. Additional adjustments for diet quality and waist circumference attenuated the associations with cardiometabolic variables, but the differences remained significant. If you’re still not convinced, consider this final salvo, from the European Journal of Clinical Nutrition in September. Researchers at King’s College London analyzed the breakfasts eaten by 60 kids, then gave them a battery of cognitive tests. Now, it’s old news that breakfast makes you smarter. The new wrinkle in this study is that they broke the data down into four groups depending on glycemic index (how quickly sugars will enter the bloodstream) and glycemic load (glycemic index times portion size). The results weren’t entirely straightforward, but the best option seemed to be a low-GI, high-GL breakfast — in others words, have a big breakfast but make sure it’s not just a bunch of sugar and refined cereal or bread. Last point: this isn’t carte blanche to totally ravage the breakfast buffet. In the study that sparked this post, one of the foods that contributed most to breakfast calories was cake (51 cal for the obese group, 132 cal for the normal group!). I mean, come on! If the Else-Kröner-Fresenius folks are advocating skipping breakfast to lose weight, then I heartily disagree. But if they’re just suggesting that you should go easy on the cake and sausages, then yeah, that sounds like pretty good advice — at any meal. 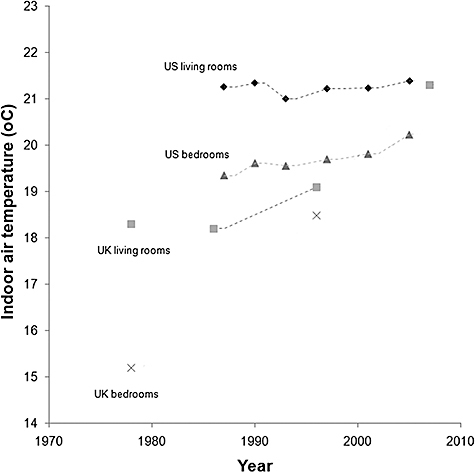 Increases in winter indoor temperatures in the United Kingdom, United States and other developed countries may be contributing to rises in obesity in those populations, according to [University College London] research published today. The claim comes from a new paper in Obesity Reviews (press release here), and on the surface, at least, seems plausible. Reduced exposure to cold may have two effects on the ability to maintain a healthy weight: minimizing the need for energy expenditure to stay warm and reducing the body’s capacity to produce heat. 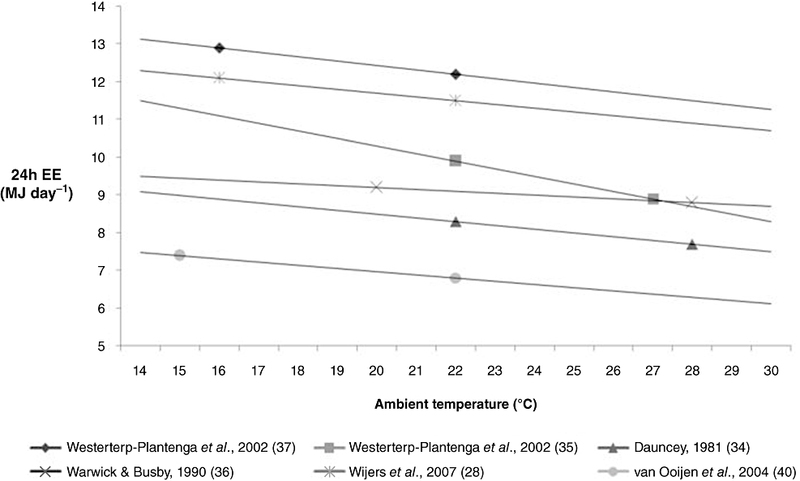 This is the crucial data — 24-hour energy expenditure as a function of temperature. Could it make a difference? Maybe. But before anyone gets too upset about this, I should note that even the authors of the paper aren’t proposing that this is the cause of obesity — they’re just suggesting it could be one of the many contributing factors. 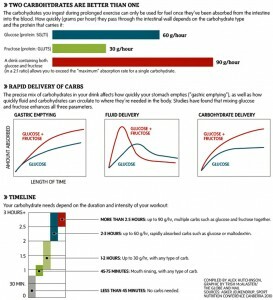 How long can I go before I need to “refuel” with carbs, and how much do I really need? If you’re spending nine hours doing an Ironman triathlon, you definitely need fuel. Samantha McGlone, the 2007 World Championship silver medalist, downs five sports drinks during the bike ride, and adds one or two energy gels an hour to her drinks during the run.